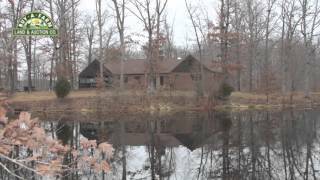 40 Acres Marion County IL All brick 3-bedroom home on 40 acres of managed timber with two lakes. Great fishing and hunting! Picturesque setting for this all brick home. Set on +/- 40 acres of managed timber between two stocked lakes among beautiful oaks. Relax on the 3-season porch and watch the wildlife that surrounds you or look out of any of the many windows. This nice 3-bedroom home has 2.5 baths, formal dining and living areas and a wood burning fireplace in the family room ready for you! Fish in either of the lakes and hunt on your own property. A concrete block building and an open side building can be used for storage or a workshop. Good blacktop road with low traffic provides access and privacy. It doesn’t get any better than this! South Central School District. Taxes $3,016. Directions: North from Salem on Interstate 57, 10 miles to Kinmundy exit. Head west on County Road 1050 E approximately 2 miles, left (south) onto Bilek Road. South about 1 mile to Green Ridge Road. Turn right onto Green Ridge. Property is on the left in about 1-1/2 miles where Green Ridge intersects with Gray Road. Originally Listed At $425,000.